Don't just go through life...live it! It all begins to sink in as the years pass by. Time really does fly... And if you have kids they are the mile markers of life's journey. I remember growing up and I remember the ups and downs. I remember when my parents would have a tryst and mom said she needed a break and was gonna leave for a bit. I remember thinking...'take me with you'. I didn't have a bad life at all, don't get me wrong. It just had it's normal ups and down. I grew up the oldest of 6 brothers. I had more brothers but I did not see them but maybe once a year. So here I am living the dreams I had where I thought I saw my mom holding just one more baby in her arms, after she had told me very assuredly, that she was NOT having any more. I knew I saw a baby girl in someones arms...then I had that same dream..again. My mom told me it had to be me. As it turns out, it was. Here I am, my family complete, with three girls and one boy. I have found through the years that in some ways we parent the same as we were raised and shy away from other things. We allow things we were not allowed and restrict the new 'temptations' available to our youth these days. I am eagerly trying to grab ahold of the ups and stay away from the downs. I don't want to just survive in life..I want to live it. And I want to teach my kids to live as well. And living begins with a decision. That decision is to be happy...and that begins by simply smiling and think of one thing to be happy about. I know what I am happy about...do you! So..update on garden! Since there is a drought happening and super hot...for a really long time...AND I went back to work part time~ This year the garden has been a fail garden. 100+ days of 100+ heat and not having the extra time to care for it...yeah..sadness. 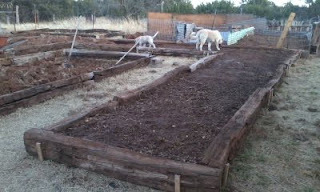 My sweet husband though has prepared the garden and we have very large plots of raised beds and three compost piles. All we need is water and a little...yes little sun. We have not given up..we are just taking a reprieve. The picture was from a few months ago before we planted. This is maybe one quarter of the garden. I envision so much for this place...and it will be..someday...a fruitful garden.